This selection is about behavior in school and the horrible effects of bullying. It offers a solution and cause for bullying that is a great discussion starter. It is also introducing “No Name Calling Week” from January 23 to January 27, 2012. A site you can go to for learning more about this is http://pages.simonandschuster.com/nonamecalling. From the Jacket: The Barker twins, Morgie and Moffie, are so excited: A new student is joining their class! Morgie makes her a welcome card, and Moffie can’t wait to play blocks with her. But when Ms. Shepherd introduces Carole Anne to the class, she doesn’t smile. Instead she causes trouble. She pushes Moffie in line and scribbles on Morgie’s drawing. She even throws Morgie’s special dinosaur book into the bushes! With Carol Anne making it impossible for anyone to like her, everyone in the lass starts to ignore her. But one Saturday, Morgie hears someone crying behind the bushes near the Barkers’. It’s Carole Ann! Will Morgie try to find out what’s wrong – before there’s even more trouble in class? Why I like it: As usual Tomie dePaola has introduced a theme common to all elementary school students; fear of starting school in a new place or for the first time. With his clear style of writing he has explored the themes of bullies as well as friendship. And to beat all he has developed a strategy to solve the problem. With this theme prevalent in our schools today, this book should be imperative to be in every school library and recommended reading for all elementary school students. For more books with resources please visit Perfect Picture Books at Susanna Leonard Hill’s blog. You can also click the PPBF badge on the right and web will automatically wisk you away to the resource page. Would you read it? Would you like to read it to your child out loud? There is the last installment of author Susanna Leonard Hill’s interview on Tuesday to come back for and we promise a give away in time for Ground Hog Day. Eeks, I know how time marches on but I promise you won’t be disappointed. If you enjoyed reading this post and would like to receive future postings, please enter your email address and click the Sign Up button at the top right of this page or click the follow button. This entry was posted in blogging, Clara Bowman-Jahn, Clarike Bowman-Jahn, Course or Book Review, social networking and tagged Bullying, Children's book, No Name Calling Week, Perfect Picture Book Friday, Tomie dePaola. Bookmark the permalink. Tomie dePaola is a master story teller. And, it sounds like his book is a winner. It is hard starting a new school and kids respond in different way. Sounds like his book teaches kids a way to deal with bullies. Not an easy task. Great review Clar. Clar, I have enjoyed reading this book to classes, and it is a super conversation starter. i enjoy how Tomie de Paola also give some insights into the insecurities behind much bullying. This sounds like a great book, Clar. I love Tomie de Paola! (Strega Nona was a big favorite in our house :)) I am always glad to get another good book that addresses bullying on our list! Thanks! Great book, great review, and I’m posting your review on my FB Fan Page. I can’t believe I haven’t read this! It looks like a wonderful book with a great theme. I love Tomie’s storytelling and art. Than you for adding it to the PPBF list! Ooops *Thank* you for adding it to the PPBF list! This sounds like an excellent book, and on such an important topic. Good to see a bit of what might be behind a bully’s actions as well. Great choice! It sounds funny! I love Tommi DePaola books! I will look for it! Well actually it isn’t a funny book but you will find some basic empathy and understanding in it. I am sorry I read your review wrong! I was thinking that the kids were being trouble makers not bullies! Usually Tomie dePaola books are pretty fun and happy stories (like the Stega Nona books and the Popcorn Book) so that is what I was thinking of when I read your review. I went back and read it again. It is a very different book than the others of his I read. Bullying is an important subject our school has a whole program against bullying. I am going to see if our school library has this book. Thank you for telling me the correct message! Sorry I took the wrong meaning. No Worries, Erik. So glad you checked back. 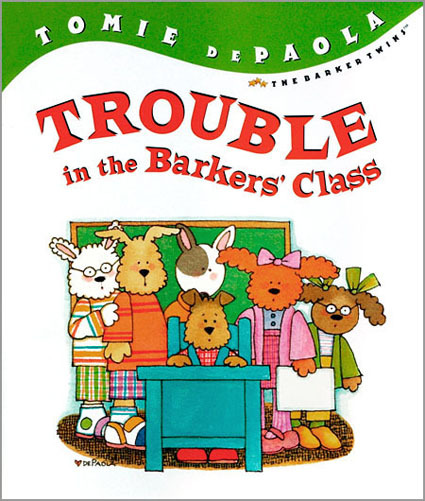 Yes, you are right about the books Tomie dePaola usually writes are of a different caliber than this one. This one is totally different than the Stega Nora ones. I’m not too familiar with others but the ones I am familiar with are of a lighter tone. This coming up week starting with the 24th is especially geared towards no bullying so you may want to check out the link at the beginning of the post of No-Name Calling Week. There are a lot of books on the subject that is on that link and more all the time. People seem pretty active against bullying. I keep wondering how it is that is thriving in the schools with all the programs against it, but it is. Some how bullies know their way around the teachers and grown ups so that they can still hurt kids. It is a shame. I hope you take care. Great choice of book and author Clar. I did a write up about Tommi De Paola some time ago on my blog. Love his wit and clever writing, dealing with everyday issues. He makes it simple and easy to understand and goes behind to dig out reasons… Well done, so happy to see one of his books hitting the list. I would read it — as a mother and a twin. I’m always interested in stories with twins. I’m going to check out this no name calling week link too. Thank you. Looking forward to the next installment of the interview. Thank you, too, Stacy. So glad to have made a good choice. Very good choice. This is always an ongoing issue somewhere in our school. The little kids really relate to these kinds of books. Not only would I read it…I am going to run out and buy it! Tomie di Paoli is my absolute FAVORITE picture book author and illustrator…and this is a book I have never seen or heard of…so THANK YOU for bringing this book to Susannah’s PPBF. As you said, the subject of bullying is one that needs to be addressed in every home, school and playground and it sounds as if this would be a perfect book to read to kids to help get the message across. I will definitely use it in my program!